Each film-coated tablet contains 300mg of standardised extract (as dry extract) from Milk Thistle fruits (Silybum marianum (L.) Gaertner) (equivalent to 7200mg-8100mg of Milk Thistle fruits) corresponding to 174mg of silymarin calculated as silibinin. Extraction solvent: Acetone 95 v/v. Tablet Core: Maltodextrin Microcrystalline Cellulose Sodium Croscarmellose Stearic Acid Magnesium Stearate Colloidal Hydrated Silica. As for all medicines a patient information leaflet is required. 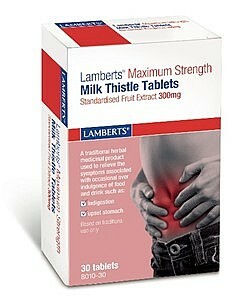 Please read this leaflet carefully before taking these tablets. For a copy please call 01892 554314.